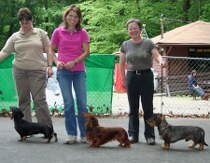 SPRING in Reinhold, PA, USA 15569, on May 4-5 our judge will be Dr Anne Posthoff she is also a vetenarian from Germany. 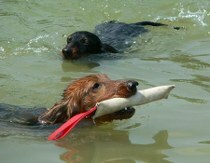 Zuchtschau and seminar will be held. 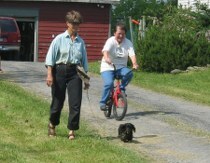 FALL in Maricourt, QC, Canada close to VT borders on August 29-30-31 and Sep. 1 Zuchtschau judge will be Mrs Cornelia Preuss form Germany. 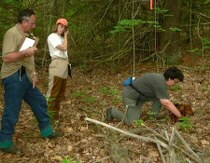 There will be blood tracking, water, gun shyness, and BHP tests offered. 2018 NATC event was held at the beautiful Richardson Wildlife foundation. 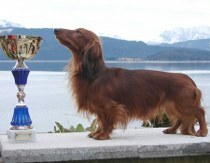 The tracking test Fährtenschuh (scenting shoes) was won with a price 1 with a perfect score of 100 points by our host for the event Ed Richardson and is standard wire haired Brawney. Congratulations to what great team. 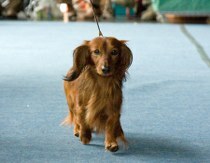 The Zuchtschau Best in Show (BIS) on Sunday May 27 th was won by the standard long haired owned by Milissa Sebley. Thank you to all the participants for coming and bringing the wonderful Teckels to the event. It was a great event and thanks to ourhost Ed for behing such a great guess wuth the help of its staff. 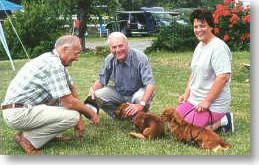 NATC Zuchtschau 2000: Herren Woerdemann and Ransleben are enjoying Patt Nance's "v Dorndorf" longs. 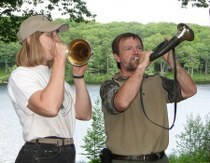 NATC Zuchtschau 2001: Susan Fuller, Herren Woerdemann and Ransleben, and Judy Stephenson, the show chairperson. 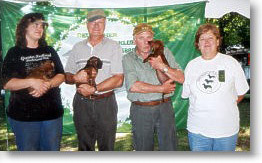 NATC was initiated by a small group of people who used their dachshunds for hunting. These people wished to have access to the broader range of hunting tests of the sort offered by the Deutscher Teckelklub (DTK). 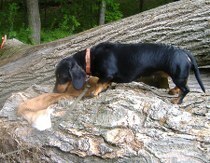 They also believed that the conformation standard of the DTK was best suited for dachshunds which are called upon to work long and hard above and below ground. 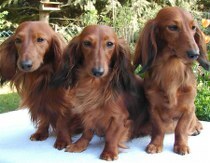 By January 2000 the new club was formed, held elections to establish a 5-member Board in March and was voted in as a member of the World Union for Teckel by the end of April. The NATC is a full "Gruppe” within the DTK Regional District Rheinland. 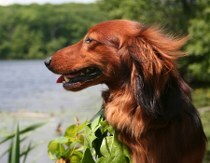 We hold one Zuchtschau (conformation shows) a year, all of which are judged by FCI judges. 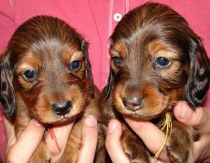 We have registered DTK/NATC kennels breeding the following breeds: standard wire, standard long, standard smooth, mini long, mini wire and Kaninchen long. 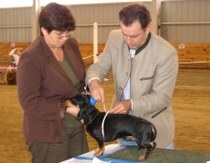 NATC-bred teckels have proven themselves successfully in the show ring, at hunting tests, in the field and in the whelping box. Additionally there have been several imports to improve and enlarge our gene pool. We are working hard adapting the DTK test rules as necessary to deal with American game, customs and hunting legislation. The high standards of the DTK are upheld. Currently we have several NATC tests: a natural den test (Naturbauprüfung), Spurlaut test, two blood tracking tests (Schweissprüfung), Water Test, Gun Steadiness and Companion Dog Test. 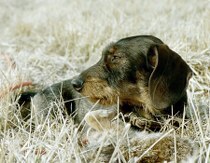 We have five DTK-approved transitional judges and one fully certified and appointed DTK judge to judge NATC hunting tests. We hold hunting workshops for members and non-members where we practice our hunting tests, hold official tests and enjoyed a strong camaraderie. 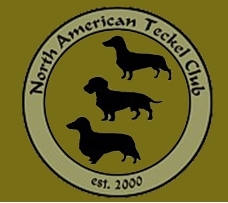 The club has its own bimonthly newsletter Teckel Talk which disseminates information to the NATC membership. 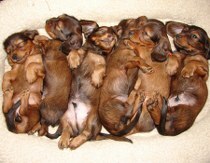 We have translated the Commentary to the Standard, published by the World Union for Teckel (WUT) to help with the understanding of the correct anatomy of the dachshund. 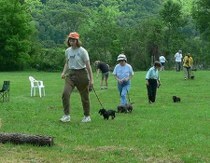 A representative of the NATC attends the annual WUT meetings in order to promote the club and to forge good working relationships with the dachshund clubs of the other WUT member countries. Our plans for the next few years include the forming of our own Regional District within the DTK. We are working on Bylaws, the division into several groups and the many details involved with such a huge and important step. This step will help with membership growth and bringing our events to different parts of the U.S. and Canada. We deeply appreciate the strong support of the DTK.